Prime Minister David Cameron resorted to France-bashing on Sunday, as he mocked the ailing French economy in a bid to get one up on his political rival, Labour leader Ed Miliband. Writing in the Sunday Times, Cameron took a jab at Miliband for having desired to replicate France’s left-wing model of economic management in the UK. The Conservative Party leader speculates that if Miliband had pursued “his French dream,” Britain would face high unemployment, dropping living standards and higher debt. 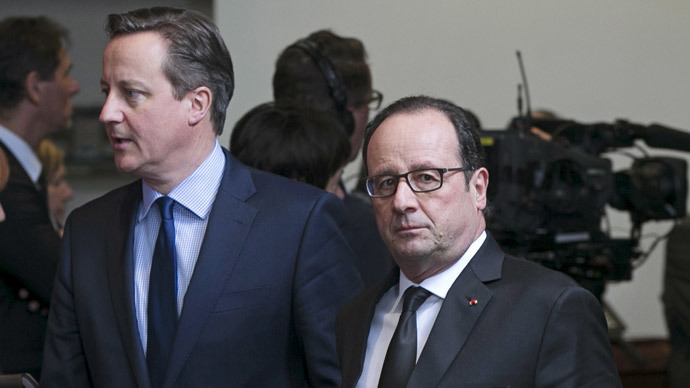 Cameron’s diplomatic faux pas follows similar France-baiting by Chancellor George Osborne during his budget speech. “He wanted us to follow the same path as the new French government. But where has that path led?” Cameron wrote. “Unemployment over the Channel is almost twice what it is in the UK. Our economy is growing seven times faster than France’s. “Imagine if Miliband had been free to pursue his French dream: the fallout would be felt in catastrophic job losses, falling living standards, eye-watering debt and fast-diminishing hope in our future,” he added. Cameron’s swipe at Miliband at the expense of Britain’s closest continental neighbor follows similar comments made by Chancellor George Osborne during his budget speech last Wednesday. Osborne commended his own economic track record by claiming the “great county” of Yorkshire has created more jobs in recent years than the whole of France. Data from Eurostat indicates employment in Yorkshire increased by 76,400 between 2010 and 2013, while during the same period employment in France grew by 66,000. Agence France-Presse (AFP) described how British MPs “loudly signaled” their approval for the chancellor’s remarks in Parliament. La Tribune described Osborne’s speech as just one example in a day of “French-bashing” in Westminster. The newspaper went on to say it is not the first time the British PM has taken a mocking tone towards France, citing a speech Cameron made in June 2012 where he offered to “roll out the red carpet” for French companies fleeing President Hollande’s tax increases. “Output per hour worked is still 2 percent below its pre-crisis peak; in the rest of the G7 group of rich countries it is 5 percent higher,” the Economist wrote.